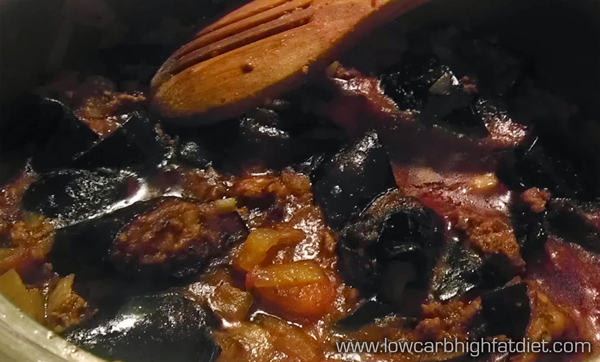 Sometimes a traditional dish turns out to be very easy to convert to a low-carb high-fat version. One of my husband’s favorite dishes to cook is moussaka. 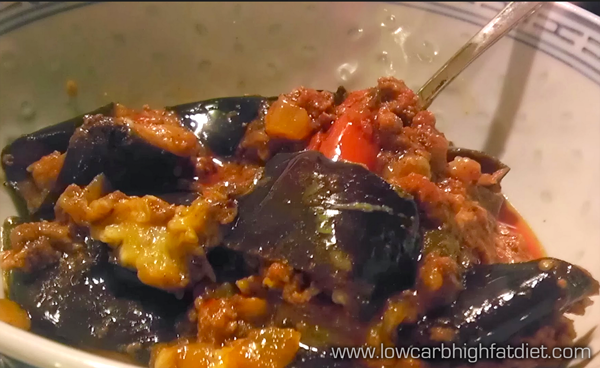 This is usually an eggplant or potato based dish, built around meat and tomato sauce, and served either warm or cold. Just by tweaking a few of the ingredients, it’s possible to make this dish very low-carb, and build-up on the healthy fats. Moussaka the way that my husband makes it is based around eggplant. And the way that he prefers to prepare the eggplant is by deep frying it. 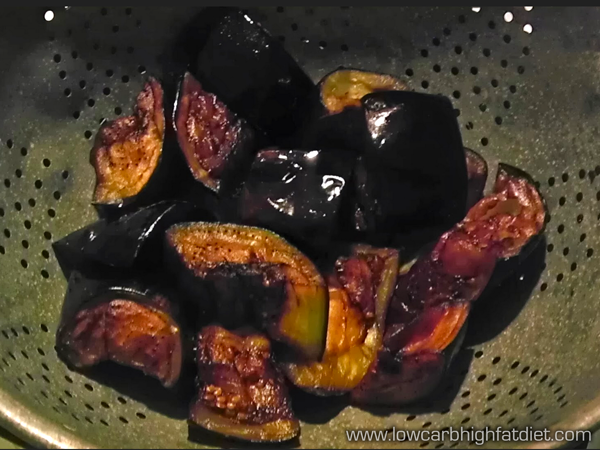 in the old days, before we started on our low-carb high-fat way of eating, I used to recommend that he bake the eggplant instead of deep frying it. Nowadays I say bring on the fat! We do deep fry in canola oil, which is probably not the healthiest fat, but it does a good job, and it stays fresh between uses. This is a dish my husband has been making for years. He likes to tell me about times in his mother’s kitchen, sitting up on the counter as little boy watching her make this, and helping out with cutting the ingredients and stirring the pot. So for him, this is profound comfort food. I can certainly see how. The resulting dish is sweet and rich, with a thick and chewy texture, and a nice meaty base that I easily associate with homey comfort. It’s become a staple around our house. He starts by washing and slicing the eggplant, then salting it and leaving it to sit in a strainer for an hour or so, until the liquid starts to leach out. I don’t think this step is absolutely necessary, and he doesn’t always do it, but when he does I do notice the difference. The eggplant has a less bitter taste, and the salt does add to the flavor. After rinsing the eggplant and straining off the liquid, the next step is to deep fry the eggplant. He sets the oil in the fryer to about 350°F, but this doesn’t have to be exact. I’ve seen him do this on the stovetop just kind of eyeing it. The goal is to get the eggplant nicely browned and cooked all the way through before adding it to the moussaka. While he’s deep frying the eggplant, he also fries up some chopped onion, and mixes in some ground beef, salt, and pepper. These he sautés on the stovetop until the onions and beef are crumbled together and nicely browned. Again, in the old days, I would have recommended that he drain off the fat from the meat before proceeding, but now I say the more saturated fat the better. Before adding the eggplant, he pours in a little bit of tomato sauce. This is a tricky ingredient, because prepared tomato sauces tend to have a lot of sugar in them. He used to use more tomato sauce for this dish, and we didn’t care what brand. Nowadays we’re very particular about the brand we choose; we read the ingredients carefully to avoid as much added sugar as possible, and we generally use only about a half a cup of tomato sauce for an entire batch of moussaka. You could also chop up tomatoes, or use canned tomatoes, but you would need to cook these down for longer if you are not using a prepared tomato sauce. At this point the eggplant goes in, along with any herbs and spices that you want. My husband usually adds some basil, some oregano, and some cumin. Then the mixture is stirred over low heat and left to simmer for a long time. Sometimes it’ll simmer for 20 minutes, sometimes we leave it on the stove for up to an hour. It’s very forgiving. Moussaka is a great main dish, and it can also be a good side dish. One of my favorite ways to serve moussaka is with a side of low-carb high-fat mashed cauliflower. I’m used to thinking of moussaka as a dish that comes with eggplant on the bottom and mashed potato on top, whereas my husband thinks of it is just an eggplant dish. For me, the mashed cauliflower replaces the mashed potato perfectly. Either way, it’s absolutely delicious, and perfect for a low-carb high-fat diet. 1. Chop and salt the eggplants, leaving the pieces to drain for an hour. 2. Heat your cooking oil to 350°F. 3. 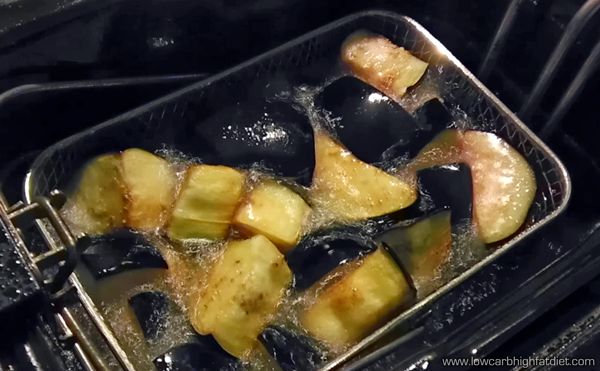 Drain and rinse the eggplant, then deep fry in the oil until browned. 4. 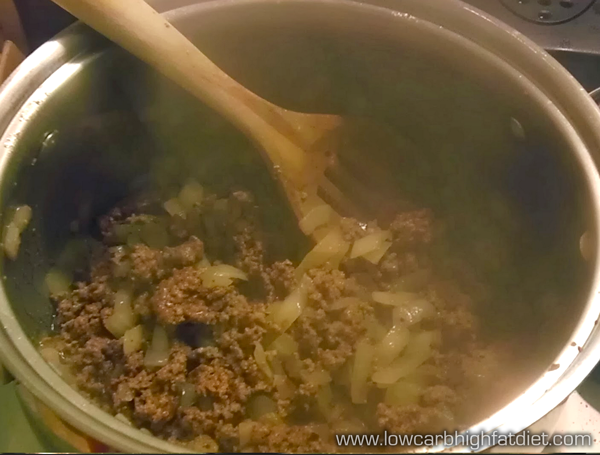 Sauté the chopped onion and the ground beef together until browned. 5. 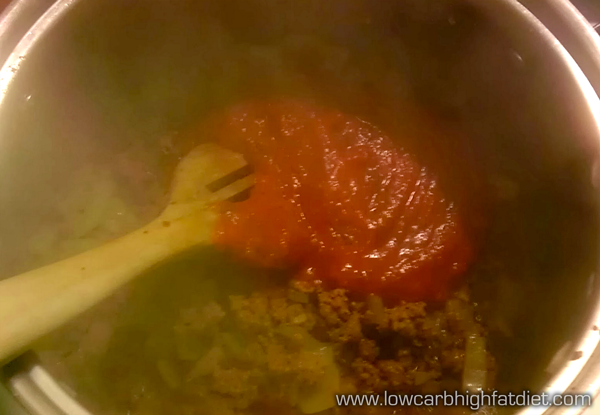 Add the tomato sauce, salt, and pepper to the beef and onion and simmer for a few minutes. 6. Add the eggplant, herbs, and spices to the ground beef and stir gently to mix it all together. 7. Set the temperature low, and simmer covered for half an hour or longer. 8. Serve hot, warm, or cold as a main dish, a side dish, or a snack. This is a dish we make frequently. It’s great served hot off the stove, warm as a side dish, or even eaten cold the next morning.